What Are Bowflex SelectTech Adjustable Dumbbells All About? Bowflex SelectTech Adjustable Dumbbells are a super-cool space, time, and money-saving innovation that allows you to get the benefits of over a dozen different levels of resistance in just one simple product. Do you want all the benefits of a full set of dumbbells in over a dozen different resistance levels, but don’t want to stumble around through a house full of weights? This product offers an affordable and durable solution. 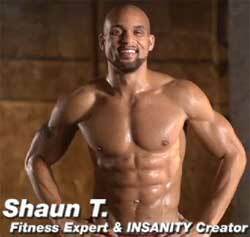 As a personal trainer, when I’m looking at a fitness product, I have to keep a sharp eye out for stuff that’s flat out bogus. There are hundreds of fitness products out there that are cheap, flimsy, and offer limited or no real utility to either a home exerciser or someone like myself who makes their living through getting results for their personal training clients. So far, I’m pleased to let you know that I have been really happy with the Bowflex family of products in terms of being useful, durable and affordable. Generally sold as a pair, two of the most popular models of Bowflex SelectTech dumbbells available are: (1) the Bowflex 552s, which are adjustable in 2.5 pound increments up 25 pounds and then in 5 pound increments up to 52.5 pounds, and (2) the Bowflex 1090s, which go from 10 pounds all the way to 90 pounds in 5 pound increments. One grip per dumbbell accommodates the plates of your choice and is adjustable by a simple dial to pick up plates in the weight of your choosing. When not in use, all the plates and the grips dial in back together into one compact unit to save space and de-clutter compared to having all those weights in separate dumbbells. I was concerned it would be cumbersome to switch weights, but it turns out it’s actually pretty slick. The process of dialing into the weight you want is quite simple and smooth, so it’s easy to switch weights rapidly so you don’t break the flow of your workout, especially if you also invest in the stand that keeps them up off the floor at about hip height to avoid unnecessary trips up and down off the ground. As a trainer, I think this product is a really neat innovation, and its 2 to 3 year warranty and durable construction make it a good investment for home exercisers, small fitness studios, and mobile personal trainers. Who Are Bowflex SelectTech Adjustable Dumbbells Good For? Since this set of just two dumbbells covers all your bases for your resistance needs from 5 pounds all the way up to 52.5 pounds in the case of the 552 model and from 10 pounds all the way to 90 pounds for the 1090 model, exercisers of all skill levels will find a lot of value in these products. The 552s would be advisable for beginners and intermediate exercisers, since the resistance range is on the lower side and more fine-tunable to allow you to progress gradually. The 1090s would be a great choice for folks who are further along in their training or starting out with a more established base of strength, as they offer heavier resistances. 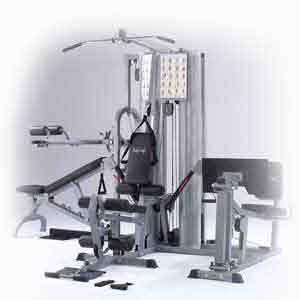 This product is an excellent choice for someone looking to establish a budget-friendly and space-saving home gym. Rather than cluttering up your home space with a messy array of dumbbells in multiple resistances, the Bowflex SelectTech Adjustable Dumbbells allow you to have over a dozen custom resistances at your fingertips with only one set of dumbbells. Consider how much time, space, and hassle is freed up by having multiple different resistances in just two pieces of equipment. If you had all the same resistances in separate dumbbells, consider the nightmare of having to pack and move all those different weights. This product would also be great for a personal trainer with a small training studio of their own, or a mobile training business where said trainer is hauling equipment around in the back of their vehicle. As a trainer who has been there and done that, I can tell you I wish I had had this product at the time to make my life easier. There are dozens of super effective full body and isolation exercises you could teach your clients with tools as simple as dumbbells in different weights that are appropriate to their level of training and the specific exercise being done. You could flesh out your mobile kit by adding a couple of inexpensive and simple pieces of equipment to the SelectTech Dumbbells (resistance bands, BOSU ball, stability ball, and pull up bar come to mind for my training style) and be able to accomplish a great deal with a wide range of clients. Who Are Bowflex SelectTech Adjustable Dumbbells NOT Good For? As established above, home exercisers who only need resistances up to around 52.5 pounds per dumbbell will do very well with the 552s, and those needing weights up to 90 pounds will love the 1090s. However, high-traffic gyms where multiple people need to use the dumbbells at any given time would likely do better to purchase a full set of traditional dumbbells to cut down on traffic jams. However, they could be a fantastic addition to a group fitness class or small group personal training, allowing participants to rapidly switch to appropriately challenging weights for different exercisers.. I will say that some types of highly trained fitness folks may need more resistance than what is offered by the Bowflex SelectTech Adjustable Dumbbells since the heaviest resistance settings they offer is 52.5 pounds on the 552s and 90 pounds on the 1090s. 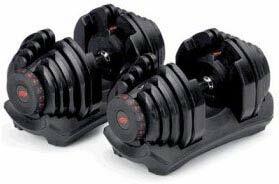 Advanced exercisers could still accomplish a lot of their training with the Bowflex SelectTech Adjustable Dumbbells, but would likely need to augment the weights available by purchasing a few additional dumbbells in heavier weights, especially for lower body exercises. So this product could be a cornerstone for these types of exercisers, but not necessarily a standalone product. For example, since a key principle of exercise science is that of specificity (in other words, training for the exact activity which you hope to improve), this product simply can’t sub in for a heavy barbell deadlift or barbell bench press, or various olympic lifts that simply require the use of an olympic bar with various weight plates all at the same height. 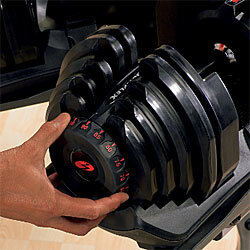 How Big Are Bowflex SelectTech Dumbbells? My concern when first viewing pictures of the product was that they might be overly bulky and awkward to use when you’re using a lower weight setting. While it’s true that they are chunkier than your average 5 or 10 pound dumbbell, I did not find this to be an issue, getting used to their size after a short while. Their size is comparable to that of the 25 or 30 pound dumbbells I’m used to seeing around gyms. The size posed no issue I could see when performing any exercise commonly done with any kind of dumbbells. Even between-the-legs dumbbell swings worked just fine. How Do You Use Bowflex SelectTech Adjustable Dumbbells? Using Bowflex adjustable dumbbells is very straight forward. Simply utilize the spin dial on each side of the dumbbell to adjust to the desired weight and then pull it from the base. As far as exercises, using SelectTech dumbbells is no different than using standard dumbbells. You can perform pretty much any exercise that you can with a standard set. As previously mentioned, I did at first feel they were a bit on the chunky side but quickly got used to their size and I didn’t run into any issues when performing common exercises. Most of you will find them quite comfortable after using them a few times, sorta like a new pair of sneakers. Let’s now take a look at some of the exercises you can do with them. 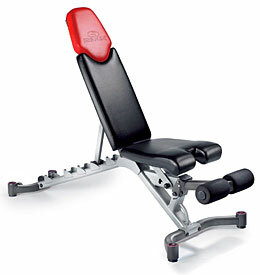 What Kinds of Exercises Can You Do With Bowflex SelectTech Adjustable Dumbbells? Just like traditional dumbbells, you can use this product to execute dozens of classic strength training, power training, and even some cardio moves. It’s possible to work out ALMOST every muscle and major movement pattern using this product, the main exception being a vertical pulling movement such as a pullup or lat pulldown. And this is not a critique of this product; just a limitation of relying solely on dumbbell-based workouts. To complete your set and get the most out of these dumbbells, I think it’s essential to have two things: a stand to keep them neat and tidy off the floor, and a weight bench to allow you to do the best chest, back, and abdominal exercises. Some sets come bundled with the accessories, or they are available for separate purchase. Mobile personal trainers could do without these accessories, but home exercisers and personal training studios should definitely take heed of the following recommendations. Having a stand makes them look more neat and appealing, which would be important for a personal training studio or a home exerciser who values tidiness or has a small space where they would be on view for visitors and housemates. Elevating them off the ground also makes it easier to sweep, vacuum, and mop your exercise space. The Bowflex branded stand is a good choice because not only does it fit the product perfectly, it is designed to complement the SelectTech dumbbells aesthetically. Even more than the stand, I would recommend the purchase of the adjustable bench for home exercisers and personal training studios. A weight bench provides a stable surface upon which to sit or lie while executing various key exercises, such as chest press, chest fly, bench row, concentration curls, weighted sit ups, hip extensions, and many more. Moreover, to specifically target certain muscles or parts of muscles, it’s important to have the ability to work at inclined and declined angles. 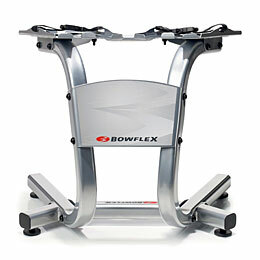 The Bowflex branded bench is a solid option, adjusting from a classic flat bench to six different levels of incline/decline from a 17 degree decline through a 90 degree straight up and down incline. This bench has a 30 year warranty on the frame and a one year warranty on the upholstery. The upholstery is durable and easy to wipe down using various non-abrasive fitness cleaning products or simply use a lightly soaped wet towel, rinse, and wipe dry to degrease. How Durable Are the Bowflex SelectTech Dumbbells? If you take care of this product, I see no reason why they could not last a lifetime. Solid metal construction and a smooth metal tab dial system add up long term durability. That being said, these are NOT the type of dumbbells you would want to drop from hip or shoulder height if that is your thing. Dumbbells that can hold up to that kind of uncommon stress are highly rubberized and all of one piece rather than the multiple plate construction of the SelectTech dumbbells. This is more a of commentary on the limitations of that (some might say unnecessarily aggressive and annoying) lifting style rather than a critique of the product in question. How Do You Clean and Maintain Bowflex SelectTech Dumbbells? Although this is designed to be a very low-maintenance product, if you’re working out hard enough to get a good sweat going as you should be, you will need to clean these dumbbells from time to time to keep them from getting nasty, just like any other dumbbells. Regular care should include wiping down with various fitness wipe type products, or rubbing down with a non-abrasive soapy water solution and wiping dry with clean towel if the handle or plates start to get grimy and need to be degreased. Use of bleach will void the warranty, as will taking them completely apart. They are not to be user-serviced if you want your warranty to remain intact. The plate switching mechanism is is designed to be self-lubricating and should not need servicing. However, Bowflex states that use of a food-grade silicone lubricant can be appropriate in the rare event that the mechanism ever starts to feel sticky. As a certified personal trainer who goes mobile, and as someone who works out at home quite a bit myself, I can honestly say that I really like this product and consider it a solid investment for both trainers and solo home exercisers. My favorite features include compact clutter-free design, versatility in terms of weights you can use, unlimited exercise execution (you can do any dumbbell exercise with them), and smooth transition between different resistances. The only downside is that the 552s stop at 52.5 pounds each, and the 1090s stop at 90 pounds each. For many exercisers this is more than enough, but super advanced folks will find themselves needing further resistances.